"Leif Hallberg’s The Clinical Practice of Equine-Assisted Therapy is a must read for anyone interested in the scope, provision, business, ethics, and science of incorporating horses in health care. As informative and thoughtful as it is honest and visionary, there is no better single source for learning about diverse equine-assisted therapies today, their current challenges, and future possibilities." "When one thinks of horses, words such as strength and majesty are often considered. Equine-assisted interventions have developed over the past fifty years and are becoming widely recognized as a form of therapy. Hallberg’s book and companion workbook are excellent sources for learning how trained horses and professionals can work together to support the quality of life for many. This book and the accompanying workbook are a must for all interested professionals." Aubrey H. Fine, EdD, licensed psychologist/professor at California Polytechnic State University, editor/author of The Handbook on Animal Assisted Therapy, How Animals Help Students Learn, and Afternoons with Puppy. "This is the book that the field of equine-assisted therapy has been waiting for! Integrating theory, research, and practice, Leif Hallberg provides the foundation for the future professional development of this evolving approach. This book is essential for anyone working in this field. It offers a vital contribution to the compassionate equestrian movement that I teach. Read it and be of benefit to all beings." "This book tells the truth about where the equine-assisted industry is today in a completely honest manner using scientific methodology. While it is a book that can be enjoyably read from cover to cover, it also should be a required reference for every person involved in the industry, especially students, practitioners, patients, and researchers." "Leif Hallberg provides us with an extensive review of the literature within the field of equine-assisted therapy in the US and reminds us how much more is needed. Acceptance of use of the terminology presented here would standardize the description of our work, erase the confusion that remains so prevalent, and promote growth in our fields. This is recommended reading for all professionals incorporating equine-assisted interactions." "Leif Hallberg succeeds in giving our industry an exceptional and unique book about the history and current state of equine-assisted therapy (EAT) in the United States. Her critical analysis based on an impressive compilation of reference literature is spot on and offers EAT practitioners much food for thought. Her ‘Vision for the Future’ examines all the important areas that this relatively new industry needs to address and provides suggestions about how to improve international collaboration, such as creating a unified terminology, defining the scope of practice, and protecting the needs of equines." "The Clinical Practice of Equine-Assisted Therapy illuminates the cognitive dissonance that has stymied the field of equine-assisted activities and therapies for the last forty years and offers a thoughtful compilation of historical reference, research, and practical discussion. Using the Equine-Assisted Therapy Workbook together with the text will provoke industry-wide self-reflection and will help both therapy and non-therapy professionals identify and advocate for their important and unique roles within this field." Kitty Stalsburg, ESMHL, CBEIP-ED, PATH Intl. master instructor and executive director of High Hopes Therapeutic Riding, Inc.
"The Clinical Practice of Equine-Assisted Therapy is the most definite book to date on understanding the role of the horse in human health care. Clear definitions and important focus on intentionality and clinical reasoning are provided, assisting professionals from different fields in better understanding this treatment strategy. With this book, Hallberg has, yet again, made an important contribution to the continued professionalization of equine-assisted therapy." "Leif Hallberg’s The Clinical Practice of Equine-Assisted Therapy and The Equine-Assisted Therapy Workbook are multifaceted, completely comprehensive guides for practitioners interested in becoming competent, ethical, and effective providers of equine-assisted therapy. These are among my top recommended resources for my own students in animal-assisted interventions." "This book expertly guides the reader through the field of EAT, providing a thorough theoretical and practical understanding of the essential details of this burgeoning field. As a college professor, Leif’s books provide me with the ‘go to’ texts of EAT; they are methodically researched, and their layout encourages student growth and progress, along with a comprehensive understanding of EAT. Thank you, Leif, for your essential contribution to the field of EAT!" "In The Clinical Practice of Equine-Assisted Therapy,Leif Hallberg provides readers with a wealth of information specific to the delivery of clinical services in this field. 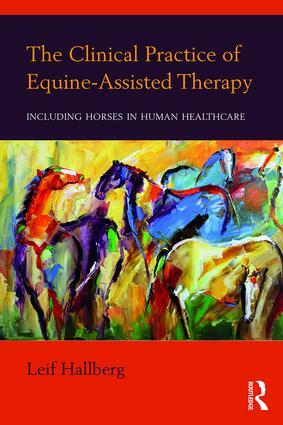 This book is thought provoking and illuminates the need to further articulate the unique benefits and characteristics of therapeutic riding and equine-assisted therapy. Using both the book and accompanying workbook will encourage other non-therapy professionals like myself to understand and advocate for our important role in this field." Patti Coyle, PATH Intl. advanced instructor, ESMHL, training and education director of High Hopes Therapeutic Riding, Inc.
Leif Hallberg, MA, LPC, LCPC, is an internationally acclaimed author, consultant, licensed mental health professional, and educator whose career has centered on the practice of equine-assisted activities and therapies. She is the author of Walking the Way of the Horse: Exploring the Power of the Horse-Human Relationship. Leif provides consultation services, offers individual sessions, teaches courses, and leads professional development trainings and workshops both nationally and internationally. She can be reached at www.leifhallberg.com.